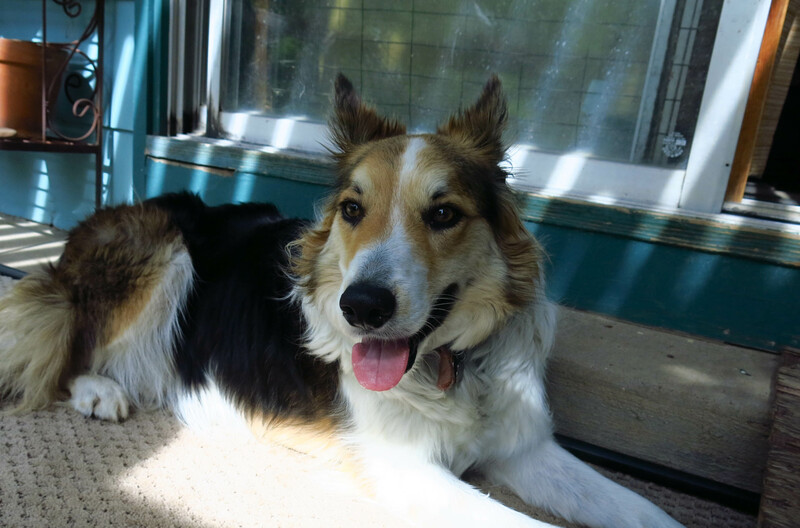 Greetings and salutations, everyone; yes, once again it is I, Mani the purebred border collie, filling in for the guy I live with, and here to bring you the latest news from our rather weedy garden. You may remember me from such posts as “The Star Student”, among so many, many others. Here I am in a characteristic pose. There was a bit too much light falling on me when this picture was taken. I really liked the picture the guy I live with took of me and posted on Facebook. I guess not many people noticed it was really a picture of me. But anyway, I guess I should explain the title of today’s post, and I think I’ll mention the bad thing first. The guy I live with said this wasn’t totally terrible, but also not hugely great. Look at all the dead branches on the honey locust. Some of these big branches died last year or the year before, and didn’t get removed because one of the extension poles on the pole saw got broken when he sawed down a big branch from a neighbor’s tree and the branch fell the wrong way and broke the pole. Sawing off the branches isn’t much of an issue, but disposing of the branches is. There’s a lot of new growth on the tree, too. 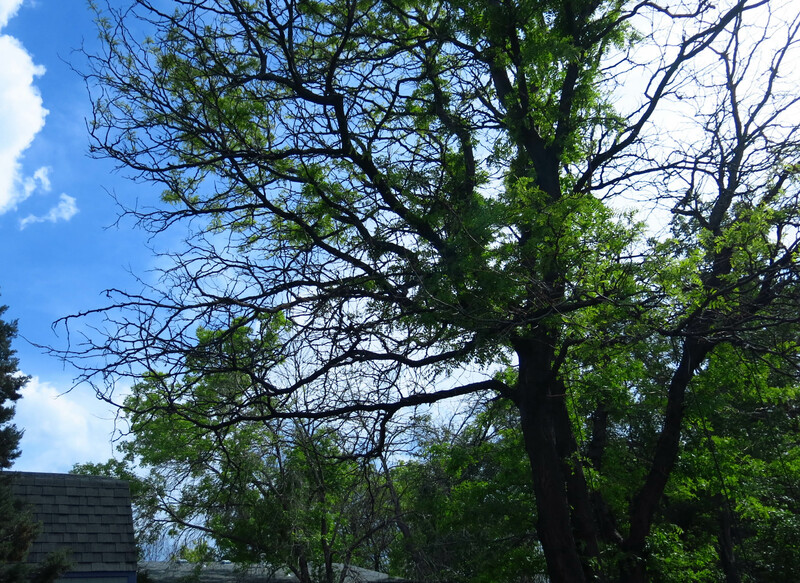 The guy I live with looked up diseases of honey locusts and the tree doesn’t seem to have any of them. We have a whole bunch of baby spiders behind the sliding glass door. There are two doors; the outer one was added later. 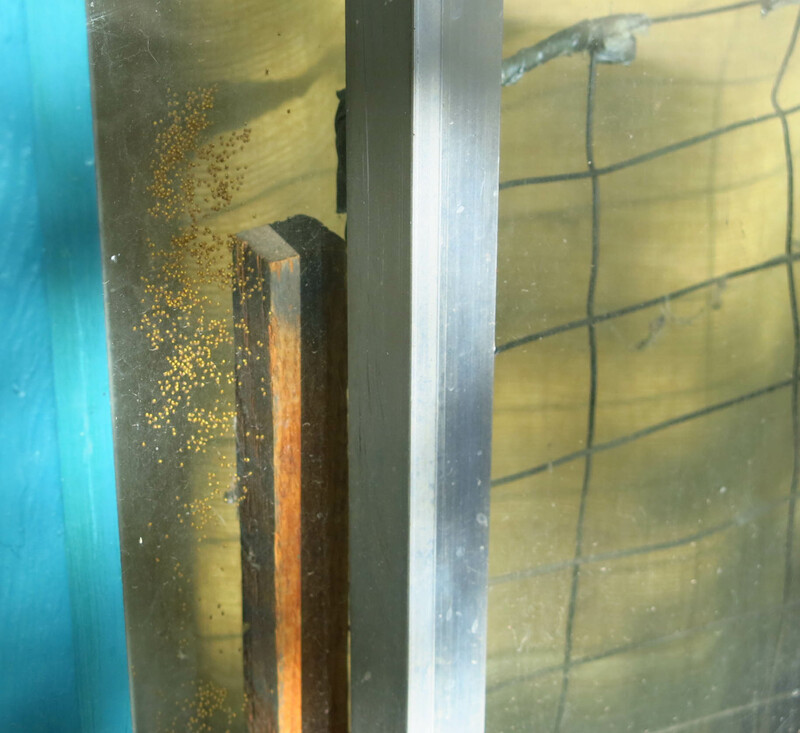 That’s one reason why you see the wooden ramp in so many pictures; the addition of the outer door made the threshold or whatever so short that a ramp seemed like a good idea (it was also for aging purebred border collies to get in and out of the kitchen). I’m not really thrilled with the idea of hundreds of spiders trying to crawl on me but the guy I live with said he would make sure they went outside. 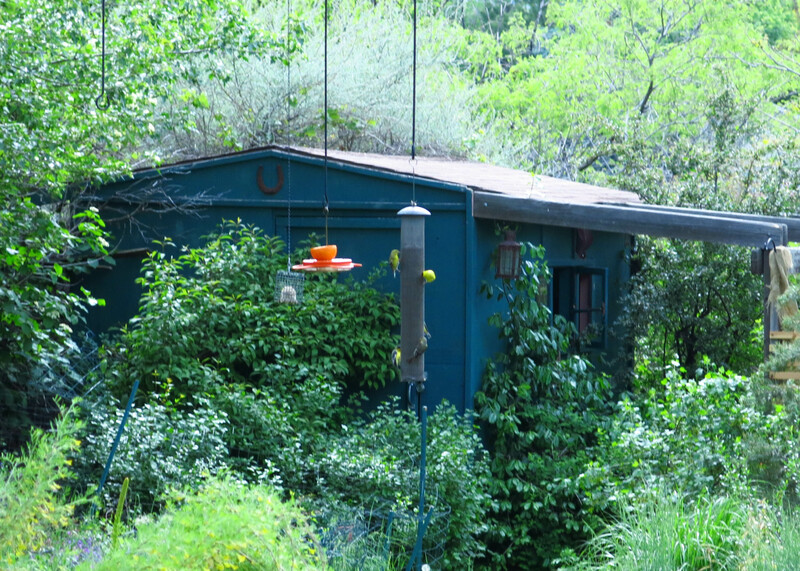 The thistle feeder has become really popular. 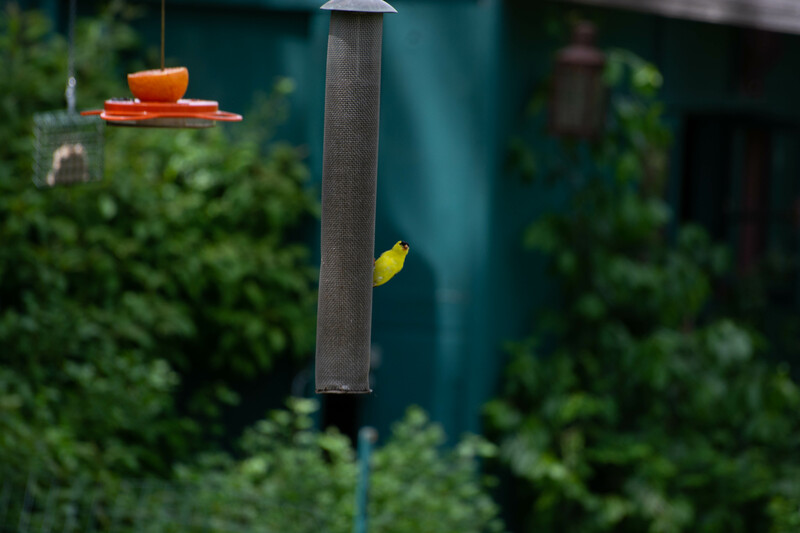 The guy I live with said he thinks we have two species of goldfinch visiting the feeder; the American (Carduelis tristis), and the Lesser (C. psaltria). Apparently (he took Latin but doesn’t remember this word) “carduelis” is the Latin name for “goldfinch”. Carduus is the Latin name for “thistle” so I guess you can see the connection. Thistles were used to card wool back in the old days and so “carding” also comes from the Latin word for thistle. The guy I live with said when he worked outside for the phone company they had a device which was called a “carding file”or “file card” which was used to roughen the surface of telephone cable during a repair, but is also used to remove metal from files. The stuff you learn on this blog. I mean, really. Now I need to talk about the garden a little bit. But first I have to go back to last Friday. The guy I live with had a dentist’s appointment in the afternoon. When he turned on the computer that morning and looked at the weather forecast he saw an eighty percent chance of severe weather with golf-ball-sized hail. I think he actually cried a little bit. He was terrified that he would be at the dentist’s and I would be here, during a bad storm. I guess this is called separation anxiety and even though he could pretty much walk to the dentist’s and I have a very secure fort which I like a lot, past experiences come to mind in situations like this. Well, the day wore on, and the forecast was changed to heavy rain. And nothing happened. He came back from the dentist’s and still nothing had happened. I was fine. Then it rained. It rained most of Saturday morning, in fact, and without thunder, too. I got to go on a few very damp walks. 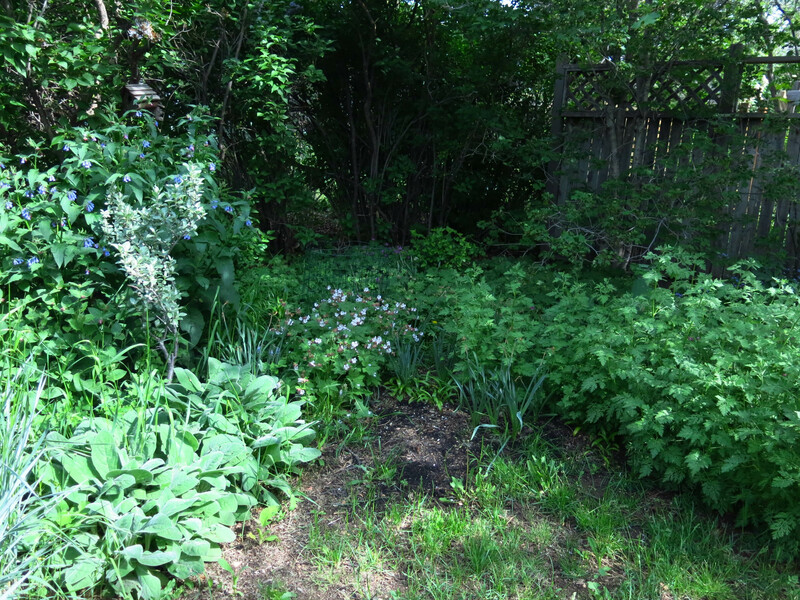 So the garden now is super green. Even the “way back” is green now. It looked kind of forlorn last month. Those are geraniums in flower. And of course there are some different things in flower. This is Eremurus spectabilis. 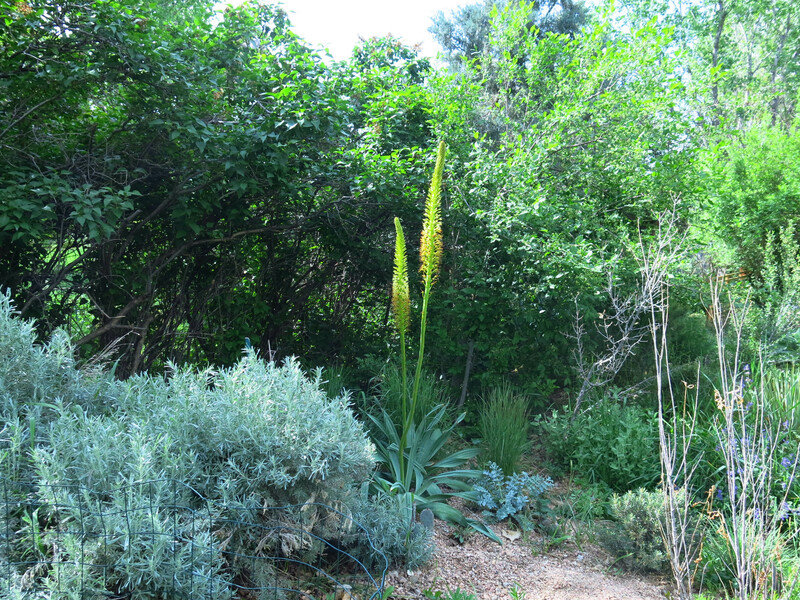 When I say “different” it’s because lots of people grow eremurus, but not this one. (This sort of thing is typical, here.) Like in this picture. This is Caragana microphylla ‘Tidy’, and the onions are Allium jesdianum ‘Per Wendelbo’. Not the ordinary alliums you see everywhere. I guess the idea of growing “different” plants is okay, but it does mean that it takes some effort finding the plants. 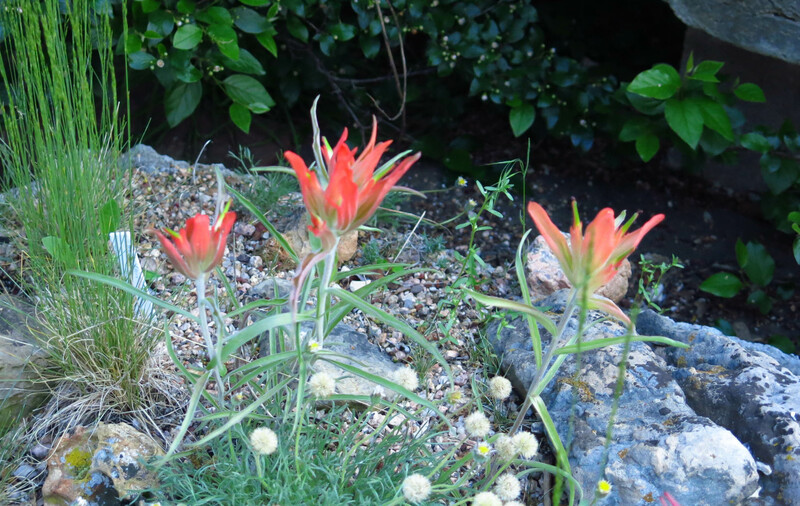 There are paintbrushes flowering in the trough. These are Castilleja integra. (The guy I live with said to say this is the easiest paintbrush to grow.) 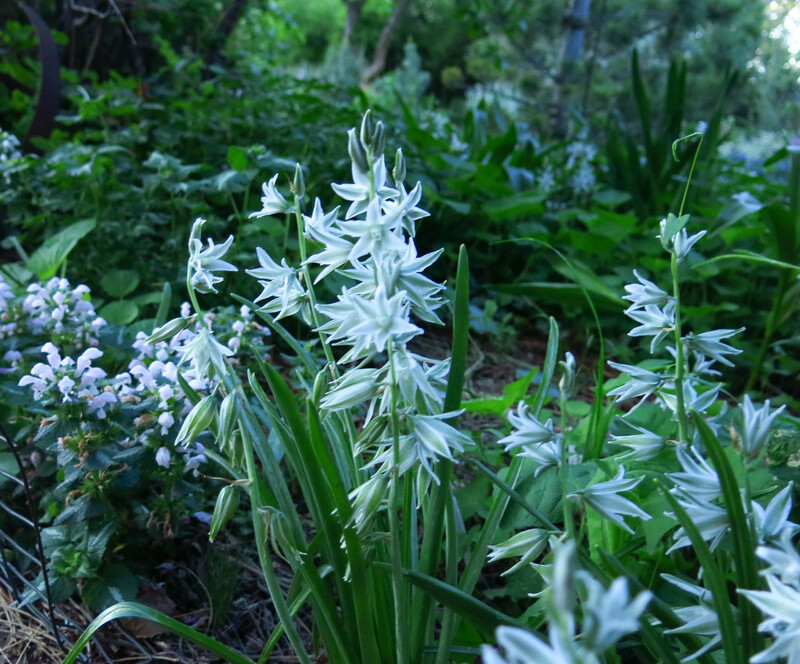 He’s been having some trouble getting good pictures of the Drooping Star of Bethlehem, Ornithogalum nutans, and so he said this will have to do. The sea kale (Crambe maritima) is doing pretty well. This is the first year it’s flowered like this, but that’s because the first plants were moved all over the garden and so never did anything. Then new ones were planted a few years ago, moved again, and then moved once more, then supposedly permanently removed, but the roots survived and now we have flowering sea kale. The guy I live with said that the leaves were “edible”. He says that with kale you always use quotes around the word “edible”. We’re not going to be having it for dinner. There used to be other crambes here. 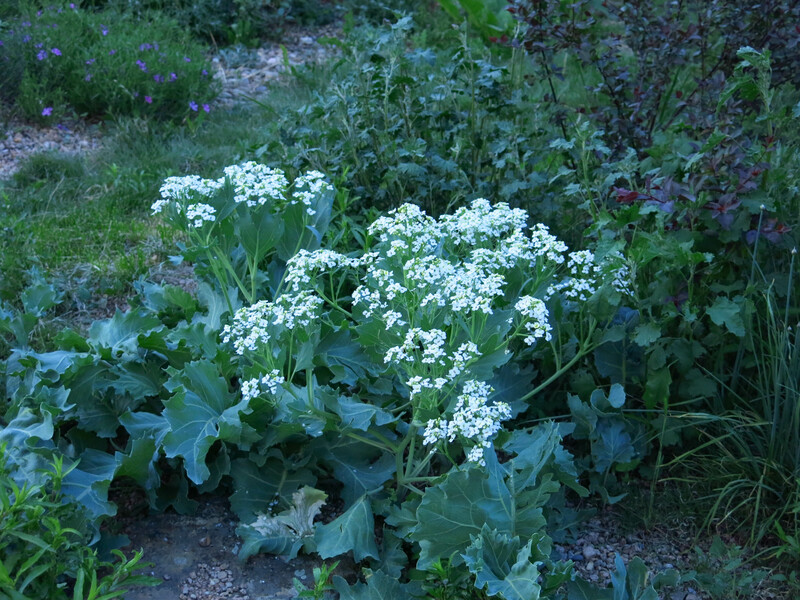 Crambe cordifolia, which is huge, eventually died, for unknown reasons. Crambe orientalis died because it got moved around the garden too many times. So that’s the news for today. 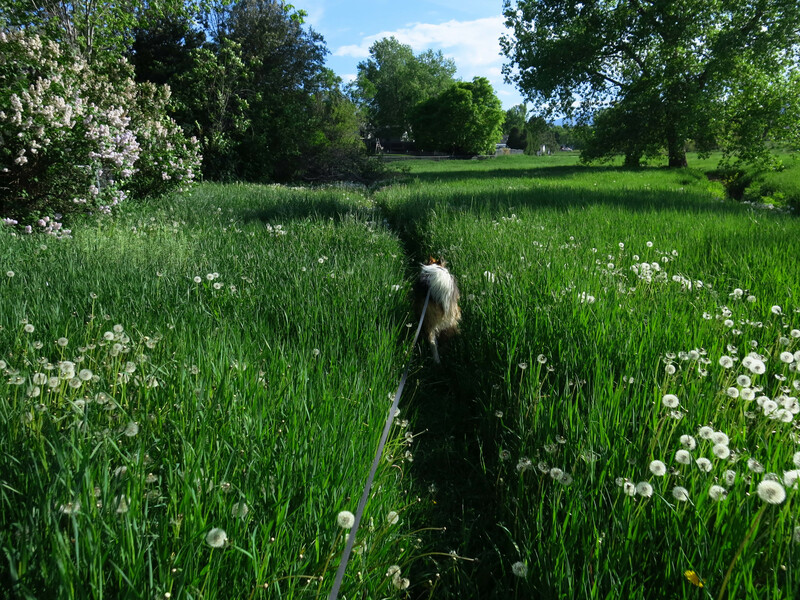 I’ll take my leave with a picture of me on my walk, following the coyote path through a sea of smooth brome and dandelions. I hope TGYLW is enjoying the beautiful garden during this, his least favorite month. These pictures and those on Facebook make it look wonderful. I even like the little spiders. I like spiders a lot especially after reading “The Snake The Spider” by John Crompton. If TGYLW hasn’t read it I recommend it. That book is no longer available but you can get just The Spider for about $4.00. He could read it to you at bedtime. The guy I live with says there are a lot of weeds. I know he’s not just saying that because a lot of time is spent pulling weeds. I like to lie pretty close to him while he pulls weeds. He said that when Cindy would pull weeds, which she loved doing, Chess would like right beside her, so I feel like I’m part of a noble tradition. I guess a few hours from now will mark the ninth anniversary of her passing. Surprising how the way this is experienced has changed but at the same time it’s always there. It’s quite possible that those books are in the house; maybe downstairs. There are lots of bugs books here. Personally, I’m not much of a fan of things that crawl, especially when they crawl on me. I got a lecture last night, and the night before, for trying to get stink bugs, on the back patio. They were rescued with a Bug Jar (a tall salsa jar with holes punched in the lid) and moved into the front yard, but the guy I live with said things about the strong smell of stink bug in the kitchen, both nights. The smell lasted for hours. Mani, I’m with you on the stink bugs. The guy I live with rescues them with a cup and cardboard, then releases them outside. When he’s not around I squash them (inside a balled-up paper towel, which greatly reduced the smell). But if the technique is imperfectly applied, blech; it’s hard then to hide my crime. In your case, since it might be hard to use my method, I’d leave them to TGYLW. My best to him today. That’s how bugs get rescued here, except it’s a salsa jar with holes punched in the lid. I’m not sure why we have to have stink bugs here. They guy I live with said “Because”. Same answer when I asked about yellow jackets, hornets, wasps, and bees. If that is the worst of the bad news, it does not seem to be all that bad. Unfortunately, it is normal for honeylocusts to sometimes let limbs die back in response to a variety of distress. It is sometimes as obvious as drought stress; but sometimes, there does not seem to be any reason for the dieback. The new growth closer in on the limbs indicates that this is what is going on. Grooming out all the dead stems can be quite bothersome. Well, I suppose this does not concern you. Spiders are more interesting. So are all the cool blooms in your garden. Thanks; the guy I live with thought it might be stress from drought. There was a time when he had a big TroyBilt chipper-shredder which did an amazing job on tree branches, but something happened to it like carburetion and idling and even though he tried to fix it he couldn’t (it was probably something very simple), and so gave it to someone who could have that fixed and would use it more. So branches have to be sawed up. (Non-locust branches are given to the neighbors for firewood on camping trips; locust smells awful when burned.) You might be able to guess what happened to all the baby spiders. Without going into detail I’ll just say that the sliding glass doors here are always open, except at night, and there is no screen door. So, the baby spiders moved away and lived happily ever after, except for that little guy who got gender reassignment surgery and moved to Singapore. They moved into the kitchen. Lol. The guy I live with says to say that out in the garage, here, is a box, containing two (2) very large, like, super really extra large, dried (so, dead, whew) tarantulas. “From Peru.” His late wife used to buy dead bugs from various places and when he cleaned and painted the studio downstairs he found the box. While checking water meters a few weeks ago, we found a small tarantula who lives in one of the meter boxes. Ick! He is not as cut as a herd of baby spiders. No. We would be against that, for sure. I am told that they taste like chicken; but I was also told that about banana slugs. I dislike chicken anyway. Here I am, Mani, bearing unsolicited advice: the guy you live with might be better off moving spiders and leaving plants alone, given the death rate. 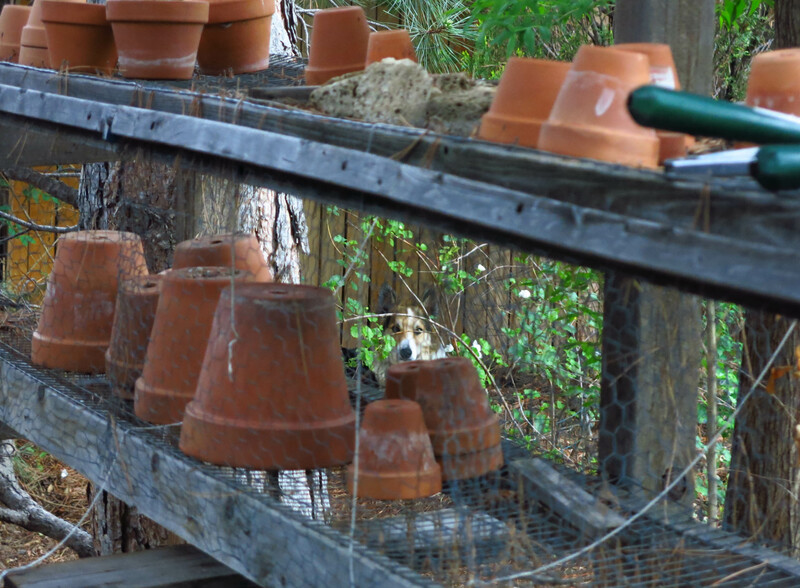 He seems almost as addicted to moving plants as he is to collecting, so probably nothing will change. Really like those alliums, which I shall have to give a go again now that I have more attention for the garden. 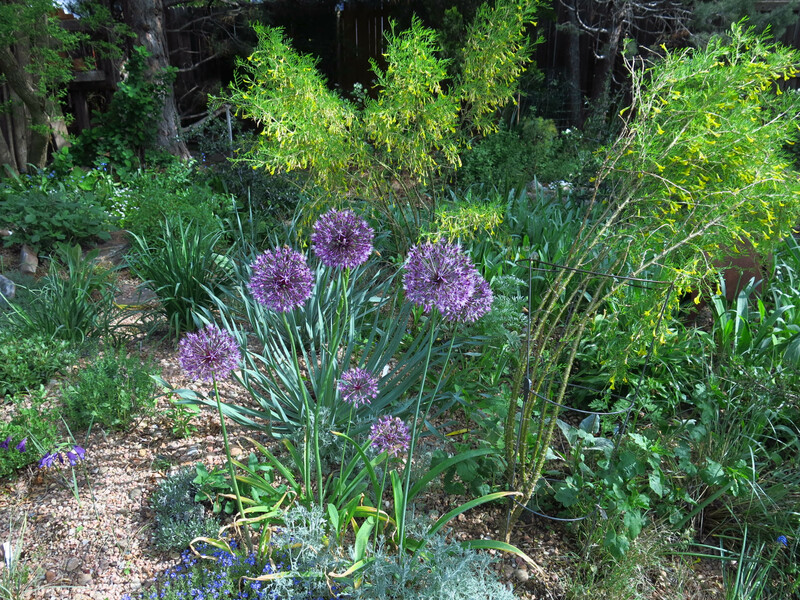 Your alliums are delightful, and I like the sea kale too. We’ve grown that kale in the past because, you know, *sea* right over there (waves arm), so the plant seemed appropriate. Those yellow birdies must provide hours of entertainment for you, Mani. You look awfully handsome walking the dandelion path, and peering in through that great assortment of terracota pots and being striated by light and shade. You’re just a handsome dog, no debate, all good. Thanks, though the spiders are smaller than a pinhead right now, so difficult to move without mashing them. There are probably lots fewer of them now but we won’t go into that. The guy I live with says if you haven’t seen Derek Jarman’s garden or pictures of it then it’s the ultimate sea kale experience. https://www.flickr.com/photos/angusf/sets/656542/ I do agree I’m handsome but the guy I live with says it’s immodest to say that. Thank you, yes, seen – perhaps even own – the Jarman book. Saw the garden (magazine) back when, I believe Jarman was still alive. I really appreciate it, but most of those around me don’t, alas. 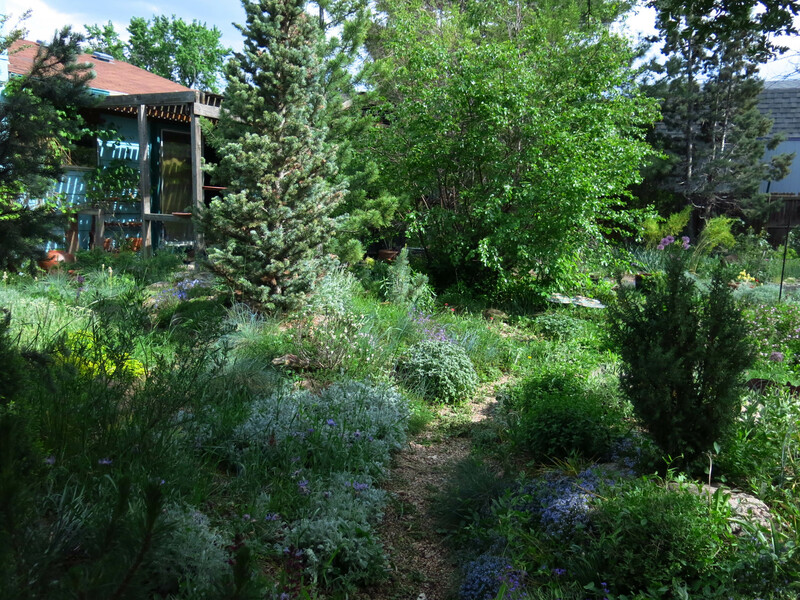 It’s a pretty different and cool garden.